My dog, Coco Chanel, is nearly five years old. Since she was about three months old, she has been very sick. It took two years to figure out she was suffering from IBD (among other issues) and food seemed to be the trigger. I ultimately had her tested for food intolerances – there were a lot – and started making her food from scratch. After eliminating many, many foods from her diet, including red meat, and finding medication that actually helped, Coco has remained relatively healthy with a few flare-ups here and there. Unfortunately, my dog is intolerant of all grains, preservatives, and a whole host of other ingredients, so other than freeze-dried turkey, I have yet to find a commercial treat that doesn’t make her sick. And we all know, dog’s must have treats! I mostly eat Paleo at home, so I’m often messing around with grain-free ways to make pizza crust, bread, pancakes, etc. although to-date I had never tried baking with ground pumpkin seeds. Having recently read that one ounce of pumpkin seeds contains 9.35 grams of protein, I purchased some organic raw pumpkin seed meal to attempt to make a healthy meat-free, grain-free treat for my dog. This paleo bread recipe can also be used for human consumption and I might even try making waffles or pancakes with it. Mix the dry ingredients in a bowl. (Sift the baking soda). Add the wet ingredients and mix well. For dog treats, pour the batter into a greased baking sheet measuring no more than 9×13 inches. 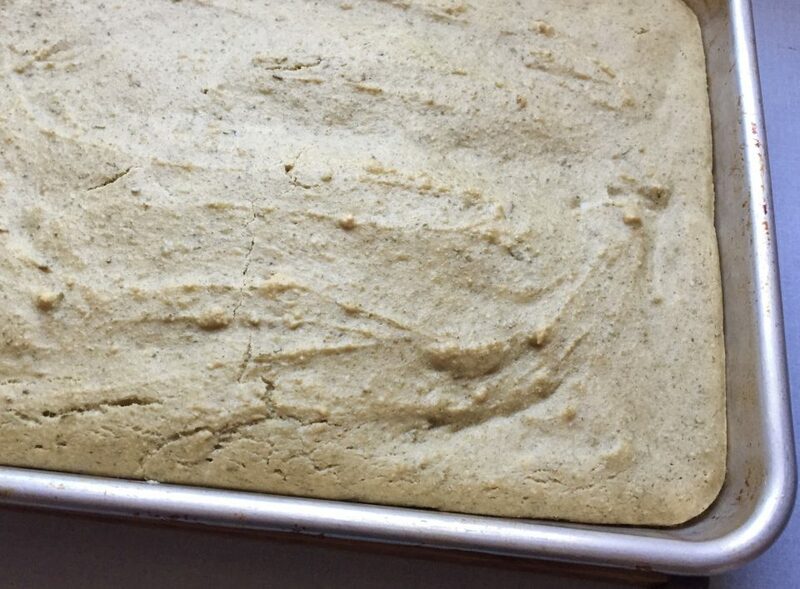 For humans, pour batter into an 8×8 inch baking dish. Bake 22 minutes (35 minutes if using an 8×8 baking pan). Bread is done when you insert a wooden toothpick and it comes out clean. Serve bread warm with soup, stew, etc. 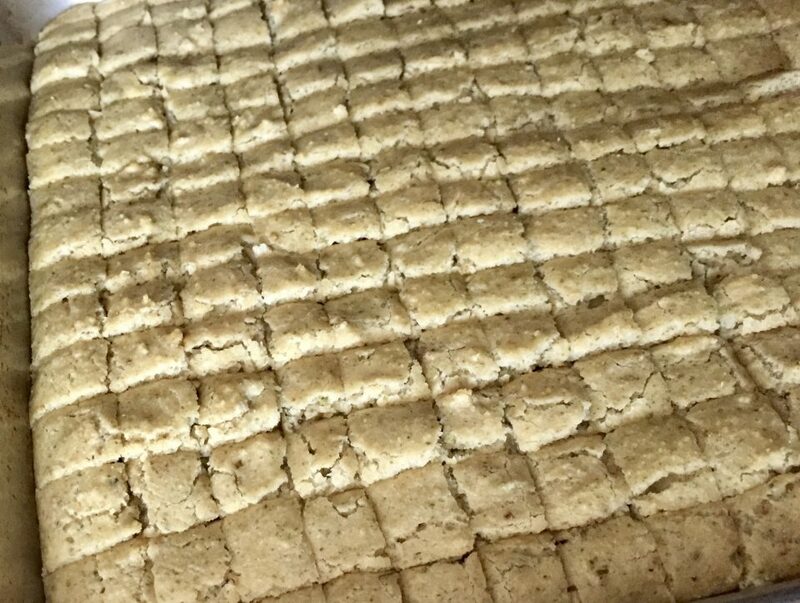 If you want a more biscuit-like texture for dog treats, remove the cookie sheet from the oven and reduce temperature to 170 degrees F. Let pan cool 2-3 minutes. 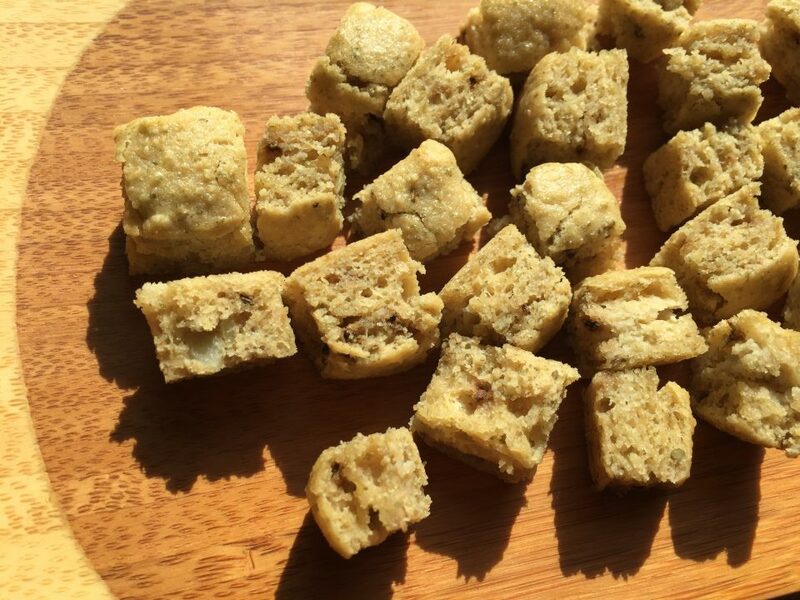 Cut bread into small, treat-sized squares, then return pan to the oven (or transfer to a dehydrator), letting the bread to dry out so it’s more like croutons. When the pieces are the texture you want, remove from oven and let cool completely. Store treats in an airtight container. Keep refrigerated or freeze until needed.